of the ice ages'. Similarly, in reference to the late Precambrian record, D. Mawson referred to the 'world-wide nature of the Earth's greatest glaciation' in 1949. After a brief intermission, when the glacial origin and climatic significance of many deposits was questioned, the ideal of low-latitude glaciation was resurrected in 1964 as the 'great infra-cambrian glaciation' of W.B. Harland. In the early 1970s, L.J.G. Schermerhorn countered by showing that many alleged 'tillites' were the result of submarine mass flow in tectonically active basins. Notwithstanding these findings, fears of 'nuclear winter' arising from nuclear conflagration reawakened interest in an ice-bound Earth in the late 1980s. This culminated in P. Hoffman's and J.L. Kirschvink's Neoproterozoic Snowball Earth model of severe, ten million-year-long global refrigerations when temperatures plummeted to -50°C, the world's oceans froze and all planetary biological activity was arrested only to be revived during short, brutal interglacials. These so-called 'freeze-fry' episodes are thought to have been a precursor to the Cambrian 'explosion'. 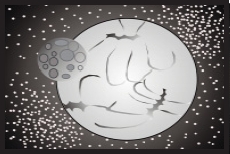 In this paper I expand on the historical development of the idea over the past 160 years and show that the current 'Snowball' version is based on several premises of 'permanentist' thinking that arose in opposition to Wegener in the 1920s and that have survived the advent of plate tectonics and sedimentology largely intact. que le monde s'est trouvé aux prises avec de terribles âges glaciaires ». De même, se référant à des dépôts de la fin du Précambrien, D. Mawson en 1949, évoquait « (traduction) la nature globale de l'étendue de la plus grande glaciation de la Terre ». Ensuite, après un bref intermède, alors que l'origine et la nature glaciaire de nombreux dépôts était remise en question, l'idée de glaciation à de basses latitudes a été ressuscitée en 1964 par W. B. Harland « (traduction) la grande glaciation infracambrienne ». Au début des années 1970, L. J. G. Schermeerhorn a contreattaqué en montrant que nombre de ces présumées tillites n'étaient que la résultante de coulées sédimentaires sous-marines dans des bassins techniquement actifs. Malgré ces découvertes, vers la fin des années 1980, la peur d'un « hiver nucléaire » résultant d'une conflagration nucléaire a vu renaître l'intérêt pour l'idée d'une Terre englacée. Ce dernier épisode a connu son apogée avec le modèle de P. Hoffman et de J. L. Kirschivink d'une Terre « boule de neige » au Néoprotérozoïque, soit un période frigorifique de dix millions d'années, la température chutant à -50°C, les océans étant gelés et où toute activité biologique était stoppée, sauf pour quelques périodes interglaciaires brutales de courtes durées. Ces épisodes d'alternance chaud-froid auraient été à l'origine de « l'explosion » Cambrienne. Dans le présent article j'explique l'évolution historique de cette idée au cours des derniers 160 ans, et je démontre que l'actuel concept de « boule de neige » repose sur plusieurs prémisses de la mouvance « fixiste » qui s'est fait jour en opposition à Wegener dans les années 1920, laquelle a survécue sans être vraiment affectée par les développements de la tectonique des plaques et de la sédimentologie. The animals were killed therefore at the same instant when glacial conditions overwhelmed the countries they inhabited'. Cuvier mistook these migratory animals adapted to a cold environment for tropical animals suddenly overtaken by cold. 2 Agassiz was greatly impressed by the ice-entombed Siberian mammoths and argued that 'a sudden intense winter, that was also to last for ages, fell upon the globe', 'the development of these huge ice sheets must have led to the destruction of all organic life at the Earth's surface' (Fig.1). He regarded the ice age as divinely inspired severing any genetic relationship between past and present life forms ('death enveloped all nature in a shroud'). Species were generated anew after each ice age. Glacial landforms were seen as the product of 'God's great plough'. The reaction of the audience after his lecture at Neuchatel was such that 'some observers feared the introduction of fisticuffs' (Bolles, 1999,p. 87). The wider public and scientists alike were outraged at his notion that a 'Siberian winter established itself for a while on ground previously covered by rich vegetation and inhabited by great mammals'. Driven by an unyielding belief in catastrophism and a fundamental opposition to Darwin's theory of evolution, Agassiz was unsettled by the notion that life may have survived ice ages unscathed in tropical oases. Agassiz was undeterred by the 1863 publication of Lyell's book on The Geological Evidences of the Antiquity of Man that marshalled evidence that during ice ages, pre-ice age species including humans, had simply moved south. J. Lubbock introduced the term 'prehistory' in 1865, recognizing that glaciation had simply interrupted organisms, not wiped them out. Between 1865 and 1866 Agassiz explored the Brazilian Amazon and found red-coloured clays with pebbles and large boulders which he called "Pleistocene Amazonian drift" (Fig. 2b). This he argued was evidence of 'a series of physical events extending over the whole globe...if the geological winter existed... it must have been cosmic'. To some, Agassiz's 1866 paper on 'Traces of Glaciers under the Tropics' delivered in Washington D.C., arguing for equatorial glaciation, was a 'new and fundamental phase of the Ice-Age theory' (Agassiz and Coutinho, 1868). Agassiz pressed on and wrote of a 'geological winter' extending over the whole globe (Agassiz, 1876). He dared the scientific community to 'imagine, if you can, floating ice under the equator, such as now exists on the coasts of Greenland' (Agassiz, 1886). In hindsight, it was a complete blunder (Carozzi, 1974). The bouldery clay 'drift' was the not the product of a tropical ice sheet but deep weathering of igneous rocks and exfoliation of core stones (Branner, 1893; Fig. 2b). 1n 1872, one of Canada's leading geologists, Sir William Dawson (a virulent opponent of continental glaciation; O'Brien, 1971), took the opportunity to poke fun at Agassiz in his book Notes on the Post-Pliocene Geology of Canada. He wrote the glacier theory had grown until 'like the imaginary glaciers themselves, it overspread the earth', even 'to Brazil and employed to excavate the valley of the Amazon. But this was its last feat and it has recently been melting away under the warmth of discussion until it is now but a shadow of its former self'. By 1870 Agassiz's notion of a worldwide cosmic winter was moribund. It was to be resurrected once more as the record of pre-Pleistocene glaciations began to be discovered. 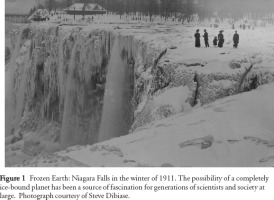 Figure 1 Frozen Earth: Niagara Falls in the winter of 1911. The possibility of a completely ice-bound planet has been a source of fascination for generations of scientists and society at large. Photograph courtesy of Steve Dibiase. Figure 2 a Louis Agassiz. Bettmann/Corbis. b Agassiz's 'Pleistocene Amazonian Drift' in Brazil. Held by him to be glacial, indicating widespread glaciation of the tropics in the recent past, it consists of core stones set in clay, the product of deep tropical weathering of basic igneous rocks. found itself in the grip of the fiercest and longest winter of the ages' was 'one of the most thrilling problems in all of geology' (Coleman, 1916). Sayles (1919) reviewed what was known of Pleistocene glaciolacustrine varves and used this model to explain the presence of banded and laminated slates commonly found with Permian and Precambrian glacials. He declared with particular reference to the Permian glacials present in the tropics of India and Africa, that 'it will now be necessary to explain not only the former presence of the great ice sheet in the tropics but marked alternations of seasons too.' Any theory of glaciation, Coleman wrote in 1926, 'must account for a world-wide refrigeration affecting all zones of both hemispheres at the same time' (p. 282). The idea of worldwide glaciation found support in the Precambrian record too. In his influential Textbook of Geology published in 1920, A.W. Grabau wrote (p. 206) of Precambrian 'glaciers extending from the poles to South Australia and South Africa' requiring 'extremes of refrigeration far beyond those known today'. After discovering widely distributed and very thick late Precambrian tillites in southwest Africa, Gevers (1931) invoked 'globally-engulfing glaciations'. He wrote 'there appear to have been glacial periods of world-wide extent'. Of course, none of these conclusions could have been reached without all these workers rejecting the idea of continental drift. the noon sun was very hot and yet we stood on a smoothly glaciated and striated floor...the tillite might well have been boulder clay by the shore of a Canadian river.... the contrast of the present with the past was astounding' (Coleman, 1926, p. 106-7). He wrote of 'being laughed at by country people while I chipped striated clasts from tillite well within the tropics not far from plantations of bananas' (Coleman, 1939, p. 450); the words 'incredible' pepper his many publications. Refusing to believe that the continents had shifted, the only other explanation was to have ice at low latitudes (Coleman, 1932). 'The dry wilting sun glare and perspiration made the thought of an ice sheet at that very spot most incredible but alluring' (Coleman, 1926, p. 123). 6 Alfred Wegener saw the global scattering of tillites in a very different light; here was clear evidence that continents were previously clustered together and had since been moved apart (Wegener, 1912, 1924). The wide distribution of Permo-Carboniferous tillites across the southern continents was a key to his reconstruction of the supercontinent Pangea and its climate belts. Despite support from the southern hemisphere where the evidence is clearest (e.g., Du Toit, 1921), Wegener's message largely fell on deaf ears. His theory of 'continental drift' as an explanation for tropical tillites was regarded as 'incredible' (Coleman, 1926, p. 263), a 'fairy tale' (Willis, 1944) and 'purely fantastic' (Flint, 1957, p. 503). Their objections are today seen as ironic because to many other geologists, Wegener's reconstruction of the southern ice sheet blanketing the polar and sub-polar regions of Pangea was the most convincing argument for continental drift (LeGrand, 1988). That the loudest opposition to Wegener came from leading North American geologists was not surprising. First, Wegener's famous map showing the supposed arrangement of land during the geologically recent Pleistocene where the outer terminal moraines of the ice sheets in Europe and North America 'join up smoothly' was patently incorrect and quickly rejected. Unfortunately, the entire thesis of continental drift was also thrown out. Second, Wegener had indirectly questioned the combined weight of their expertise by daring to question the supposed glacial origin of the famous 'Squantum Tillite' found near Boston. This was seen as a classic Permo-Carboniferous glacial deposit (it met 14 out of 15 criteria for being glacial as identified by Sayles, 1914, 1919) but Wegener's reconstruction of Pangea placed the Boston area near the equator. He warned that not all poorly sorted rocks were true glacial tillites (Fig. 3) and thus were unreliable indicators of past climate and continental positioning (Wegener, 1928). He argued that the Squantum was marine in origin and not deposited directly by an ice sheet (and in this was later proven correct; Crowell, 1957; Dott, 1961; see below) and, as we now know, is of Late Neoproterozoic age (Thompson and Bowring, 2000). 7 In 1932, Coleman wrote that 'enough has been noted to show that theories of drifting continents are entirely inadequate to account for known facts in regard to the greatest times of glaciation'. To the permanentists, glaciations were seen as 'catastrophic events in the world's history'. Cotton (1942) referred to glaciation as a 'climatic accident' and Pauly (1957) referred to 'world-wide abnormal climates'. Such events were regarded as being superimposed on static continents where deep glacial erosion and deposition of coarse bouldery sediments such as tills simply interrupted an otherwise orderly Davisian cycle of landscape and sediment evolution from youth to maturity. As a result, ancient glaciations were seen as highly unusual events ('slow motion catastrophes'; Bolles, 1999) and as such were of chronostratigraphic value because such events could be precisely correlated from one continent to another (e.g., Chumakov, 1981). Clearly, because these deposits are found on all continents and can be precisely correlated, then truly global glaciations must have occurred, a circular argument still thriving in the modern literature (see below). Figure 3 Facies problematica. Understanding of Earth's pre-Pleistocene glaciations is heavily reliant on the environmental interpretation of poorly sorted rocks called diamictites. Much past work, particularly in the Neoproterozoic, has simply assumed that such facies are tillites deposited directly under ancient glaciers. Such rocks however, form widely in non-glacial and glacial environments and are not uniquely diagnostic of episodes of cold climate. The environmental interpretation of such facies relies on examination of the overall depositional context (i.e., of the strata that lie above and below). As detailed sedimentological studies proceed, it is evident that many 'glacial' diamictites reported in the past are non-glacial mass-flow deposits preserved in marine successions and deposited under active tectonic conditions. True tillites appear to be rare in the Neoproterozic: the record of ancient cold climates is dominantly preserved in offshore marine strata where primary glacial sediment was reworked by non-glacial process (e.g., Fig. 4). Unravelling climate from such nonfossiliferous strata is a challenge. 8 The work of Mawson (1949) on the Sturtian Tillites of South Australia ('the greatest thing of the kind recorded anywhere in the world'; Mawson, 1958) is a good example of the classical approach to interpretation of sedimentary strata containing poorly sorted, laminated and banded rocks. The depositional model then available was that of continental glacial deposition where tills, glaciolacustrine and outwash deposits record the climatically driven waxing and waning of ice sheets. Ironically, Mawson's earlier visits to Antarctica, the first as a member of Ernest Shackleton's British Antarctic Expedition of 1907– 1909, had been spurred by his desire to seek 'first hand knowledge of the conditions of sedimentation during an ice age'; Mawson, 1958, p. xxvii). He was, however, greatly disappointed because 'the products of glacial erosion are almost entirely dumped on the floor of the surrounding ocean and thus not available for investigation' (Mawson, 1949, p. 52). Obliquely, he had touched on a major finding, that Earth's glacial record is selectively preserved in glacially influenced marine facies. Inspired by reports of late Precambrian tillites from equatorial Africa and their broad global distribution elsewhere, Mawson (1949) invoked a massive 'world-wide' glaciation'where glaciation is evidenced even to the equator'. Echoing Coleman's early comment on the late Paleozoic ice ages, he concluded that the late Precambrian glaciation had been the most 'severe of all in earth history', in fact, no less than 'the world's greatest ice age'. the case for glacial origin was suspect if not downright wrong. Imagine our dismay at seeing the Squantum for the first time, a classical deposit long cited as evidence of Permian glaciation in America.' Crowell (1957) explained many ancient pebbly mudstone deposits as debris flows produced by the mixing of fine and coarse-grained sediment during slumping. Ironically, the supposed glacial origin of the Squantum had been the reason why an earlier generation of geologists had rejected of the entire notion of 'continental drift' (see above). The work of Crowell (1957), Dott (1961) and Winterer (1963) led to the introduction of purely descriptive terms for poorly sorted and laminated facies that avoided any preconceived notion of a glacial origin (e.g., diamict, mixtite, symmictite, tilloid, rhythmite; see Schermerhorn, 1966). Opposition and resentment to this reappraisal of Earth's glacial record is evident in the reference to 'this bleak period of disappointment' by Harland and Herod (1975, p. 190). 10 The proponents of 'big glaciation' counterattacked with novel geophysical evidence in support of low-latitude glaciation. Harland and Bidgood (1959) reported magnetic data purporting to record equatorial paleolatitudes for Neoproterozoic glacials, and invoked a huge 'infracambrian glaciation' of global extent involving 'near synchronous worldwide tillites' (Harland, 1964, Harland and Herod, 1975, p. 201). That tillites were found closely associated with carbonates was cited as additional evidence of huge fluctuations in global climates. Paleomagnetic data were subsequently shown to be a result of later, postdepositional metamorphism and remagnetization, but a large body of paleomagnetic data has evolved in support of low-latitude glaciation (see below). It was also demonstrated that the common association of 'tillites and carbonates' was the product of active tectonic settings in which non-glacial marine mass flows were interbedded with olistostromes, debris flows and turbidites composed of detrital, reworked carbonate (Schermerhorn, 1974). 11 At the same time that sedimentology was leading to a reassessment of the sedimentary record of 'big glaciation', a second front opened with the replacement of 'continental drift' by 'plate tectonics' in the 1960s (McKenzie and Parker,1967). Schermerhorn (1974) led the charge in re-examining ancient 'glacial' deposits in the light of their tectonic and basinal setting. Building on the work of Crowell (1957) and others, he argued that many supposed Neoproterozoic 'tillites' are non-glacial debris flows of unknown climatic significance, deposited in tectonically active marine basins marginal to uplifted source areas. Their worldwide distribution that had impressed so many others simply reflected their former close proximity within an earlier supercontinent and a long history of subsequent plate movements. He identified the importance of tectonic uplift in generating regional ice covers and also stressed the poor dating control on most deposits. Others followed, such as Martin et al. 's (1985) detailed and lengthy refutation of the glacial origin of the Namibian Neoproterozoic diamictites (Fig. 5) recently proposed as key evidence of a Snowball Earth (Hoffman et al., 1998). 12 Hambrey and Harland's (1981) very impressive Earth's Pre-Pleistocene Glacial Record compiled the known rock record but perhaps missed the opportunity to place it in the context of plate tectonics and emerging paleogeographic reconstructions. This is ironic given that Harland was one of the earliest converts to plate tectonics (LeGrand, 1988). In the early 1980s, as knowledge of glaciomarine environments rapidly expanded based on shipborne studies in the Arctic and Antarctic margins, so it became clear that the record of ancient glacial climates is preferentially stored in rocks of marine origin (Anderson, 1983). Work by Young and Gostin (1989, 1991) has confirmed the glacially influenced marine origin of the classic Sturtian 'Tillites' of Australia that had been the cornerstone of Mawson's worldwide glaciation. Eyles (1993) reviewed the record in the context of broader knowledge of depositional systems and basin evolution. He confirmed Schermerhorn's thesis that a 'glacial' origin cannot be demonstrated for many ancient deposits and that most of the demonstrably glacially influenced strata had been selectively deposited in rift basins. The genetic association between glacially influenced strata deposited offshore, and uplift of elevated source areas on rift flanks was clear. If the precise causative linkages are still a little fuzzy, it is evident that the ancient glacial deposits cannot be studied in the absence of discussion of plate tectonic and basinal setting (Crowell, 1999). Similarly, such approaches are key to the discrimination of glacial from non-glacial successions containing diamictites. Figure 4 Here along the south-central Alaskan coast at Scott Glacier (a) and Icy Bay (b), primary glacial sediment such as till is reworked almost entirely by non-glacial processes involving meltwater and/or mass flow, and redeposited in the marine environment. Such conditions appear to have been common in the Neoproterozoic where the presence of open-marine conditions and the transport of large volumes of sediment by water negates claims that the planet was then entirely frozen as a 'Snowball Earth' and indicates instead, a normal hydrological cycle. Figure 5 Mammoth task. Agassiz's notion of die Eiszeit was spurred in part by the finding of well preserved mammoths entombed in Siberian permafrost then seemingly indicating catastrophic climate cooling. Here in Namibia, a modern day relative (aaaa) wanders across remote outcrops (bbbb) of Neoproterozoic diamictites currently being investigated for evidence of ancient cold. 14 The Snowball Earth of Hoffman et al. (1998) is a bold reworking of the global glaciation models of earlier workers and incorporates much new geochemical and paleomagnetic data. The model owes much to Cold War concepts of a 'nuclear winter' where dust veils thrown up by nuclear explosions lower global albedo resulting in 'complete glaciation of the world' (Budyko, 1982, p. 269; Kirschvink et al., 2000). Based on work principally in Namibia (Fig. 5) Hoffman et al. (1998) and Hoffman and Schrag (2000) propose a runaway albedo mechanism for initiating Snowball glaciation, where extreme cold and thick sea ice shut down all hydrological activity and chemical weathering such that marine autotrophic activity and organic carbon burial would cease. This, it was argued, would drive the ocean carbon isotope composition to near-mantle values. After some 10 million years, sufficient volcanically emitted CO2 would accumulate to produce global temperatures of +50 ºC starting the catastrophic meltdown of ice and precipitation of cap carbonates deposits. 15 Eyles and Januszczak (2004) reviewed the Snowball Earth model at length and showed that the model retains much of the classical thinking of the 'permanentists' of the 1920s. First, the Snowball model is based on stratigraphic analyses, which, to borrow Harland and Herod's (1975) phrase are 'sedimentologically unsophisticated'. Old, and by now very shop-worn assumptions that poorly sorted diamictite facies must be continental tillites deposited below ice sheets, and any fine-grained, rhythmically laminated facies are glaciolacustrine varvites, can still be found in the Snowball literature (Hoffman et al., 1998; p. 1342). One is hard pressed to find detailed sedimentological descriptions of strata held to record key global events (e.g., Hoffman and Schrag, 2002). This is decades after sedimentologists began to highlight the simplistic interpretation of ancient 'glacial' strata and the need for comprehensive facies and basin analysis studies. 16 Second, the model is based on the circular argument that because the deposits are tillites that are of a wide global extent, then they must record an unusual catastrophic event such as global glaciation. This assumption was first made in the 1920s and was recycled by Harland and Herod (1975) and Chumakov (1981). It is now repeated uncritically by adherents of the Snowball model such as Tojo et al. (1999) for whom 'the global distribution of glacial deposits of Neoproterozoic age suggests that the ice sheet of the time developed even to the equatorial area'. This argument has even been exported farther back in time, where according to Bekker et al. (1999) 'evidence of three glaciations in the early Paleoproterozoic...of North America... and at least one on three other continents suggests that these ice ages were of global extent'. Proterozoic glaciations must have been unlike any subsequent glaciations of the Phanerozoic 'because they can be found on every continent.... unlike the more areally limited distribution of Pleistocene glacial deposits' (Sohl et al., 1999, p. 1121) suggesting 'climatic extremes unrivalled in Earth history' (Kennedy et al., 2001a, p. 1135), and ice ages 'unlike any in Phanerozoic Earth history because of their great severity' (Sohl et al., 1999, p. 1120). It can be appreciated that these quotes closely resemble the writings of the permanentists of the 1920s such as A.P. Coleman. Available age dates do not support the contention that 'glacial' diamictites were deposited during synchronous global glaciations (Evans, 1999); in response, Snowballers spawn new snowball events to fit each new age result (e.g., Table 1 in Hoffman and Schrag, 2002). 17 Third, the Snowball model overemphasizes the apparent paradox in the ancient rock record, where 'glacial' diamictites are interbedded with carbonates and some times have distinct 'cap carbonates'. The juxtaposition is argued to record brutally hot greenhouse conditions, but as detailed sedimentological data accrue, such strata are revealed to be not primary chemical precipitates but are detrital in origin, principally the deposits of turbidites reworking old carbonate deposits, and comprise an integral part of very thick marine successions containing poorly sorted mass flows misidentified as tillites. These successions reach many kilometres in thickness and were deposited on newly formed continental margins as Rodinia broke apart and huge volumes of detrital carbonate were reworked (see below). Where present, primary and stromatolitic carbonates are separated from underlying diamictite units by unconformities or many tens and sometimes hundreds of metres of marine strata, thereby questioning any supposed immediate 'cap' relationship (e.g., Hoffman et al., 1998). 18 Fourth, snowballers suggest that evolutionary stress imposed by extreme cold, when organisms survived glaciation only by living around hydrothermal vents, played a causal role in triggering the Cambrian 'Explosion'. In contrast, what is known of Neoproterozoic Ediacarian biotas indicate they were environmentally sensitive lichen-like organisms living in shallow euphotic settings (Narbonne, 1998). The acritarch record of Australia indicates that pre- and post-Snowball populations are identical and do not indicate repopulation of marine areas by extremophiles that survived both catastrophic glaciation in hot springs and the brutal greenhouse conditions which followed (Grey et al., 2003). 19 Fifth, much emphasis has been placed on paleomagnetic data indicating low depositional paleolatitudes (Evans, 1999). Eyles and Januszczak (2004) concluded that precisely how magnetic characteristics were acquired, when, and even the origin of many of the strata being sampled remain major unresolved issues. These limitations are echoed by Meert and Torsvik (2004). 20 Sixth, the reappearance of banded iron formations in the late Neoproterozoic has been genetically linked to global glaciation; the assumption is that anoxic seawaters form below a global cover of thick sea ice thereby enabling ferrous iron to remain in solution (Hoffman et al., 1998; Hoffman and Schrag, 2002). In fact, banded iron deposits are not uniquely associated with Neoproterozoic diamictite deposits and often occur stratigraphically below such deposits, are absent outright, or are demonstrably postdepositional (Young, 2003). The reappearance of banded iron is more likely related to episodes of continental rifting in the Neoproterozoic and deposition in enclosed or restricted rift basins close to hydrothermal vents along incipient midocean ridges. 21 Seventh, the Snowball earth model relies heavily on the assumption that glaciation is inherently linked to fluctuations in carbon isotope trends derived from carbonate rocks. The model predicts positive 13C values prior to the onset of glaciation, due to preferential incorporation of 12C in ocean waters as a result of biological activity. As environmental conditions deteriorate prior to each Snowball event and organisms die off, the burial of organic carbon reintroduces 12C into the world oceans giving negative 13C values that persist until the postglacial re-establishment of biological activity. Whereas there is good evidence for systematic isotope fluctuations, the controls on such changes cannot simply be related to global glaciation. For example, snowball events have been identified, not from any direct geological record, but from geochemical data alone (e.g., Kennedy et al., 1998). How environmental changes held to be without parallel in the history of the planet left no direct stratigraphic record is difficult to understand. Additional factors that need to be considered include the exposure and weathering of older carbonate and enhanced vertical gradients in seawater 13C due to redox stratification of ocean waters and accelerated burial of organic carbon in rapidly subsiding rift basins. Isotopic excursions may be regional in scope resulting from the formation of restricted basins during the rifting of Rodinia where waters in enclosed or semi-restricted basins are in disequilibrium with global surface oceans (Shields et al., 2002). Some carbon isotope values from carbonate interbeds and clasts within supposedly 'glacial' diamictites show positive trends (Kennedy et al., 2001a). Strontium isotope data also fail to support hydrological cycle shutdown during Snowball glaciation and enhanced continental weathering in the aftermath (Kennedy et al., 2001b). Neither is the Snowball model supported by climate modellers (Hyde et al., 2000; Baum and Crowley, 2001) who identify an ice free equator (Peltier, 2004). 22 Eyles and Januszczak (2004) propose an opposing uniformitarian model to the extreme catastrophic snowball view of Neoproterozoic glaciation. The global context of glaciation in the Neoproterozoic is the massive first-order reorganization of the planet's geography, climate and ocean systems resulting from the breakup and dispersal of the supercontinent Rodinia. Commencing about 750 Ma and lasting for at least 150 million years, global rifting was the overriding control on sedimentary basin formation, basin-fill stratigraphies and glaciation. A first phase of rifting occurred after 750 Ma along the paleo-Pacific margin of Laurentia, and the second phase of rifting occurred at about 600 Ma along its paleo-Atlantic Iapetan margin (Young, 1992; Li and Powell, 2001). It cannot simply be coincidental that these two rift phases are directly linked to the two principle episodes of glaciation of the Neoproterozoic: the first phase that of the Sturtian (c. 750 Ma) and equivalent Rapitan glacials, the second that of the Marinoan and Vendian glacial deposits (c. 600 Ma). The total length of rifted margin was more than 25,000 km, suggesting a staggered climatic response to uplift as rifting progressed diachronously, somewhat like a zipper. The stratigraphic record is dominated by thick submarine slope and fan deposits reflecting rift basin formation and influxes of large volumes of clastic sediment, including carbonate debris, from uplifted rift shoulders. Such successions are dominated by turbidites, olistostromes and debris-flow facies; some, where uplift or latitude was appropriate, are glacially influenced, but many are not (Schermerhorn, 1974, 1975; Eyles, 1993). Within tectonically active basins, the effects of glacioeustatic sea level are difficult to identify because of the control on relative water depths resulting from varying subsidence rates. Very thick coarsening-upward successions, hundreds of metres (sometimes kilometres) thick that can be traced globally and hitherto ascribed to 'glacioeustatic' fluctuations in sea level (Young, 1992) are more likely tectonically controlled. In short, rather than the product of global climatic catastrophes, the deposits of Neoproterozoic glaciers are seen as similar in scale and type to those of the Pleistocene (Eyles and Januszczak, 2004a). 23 At the conclusion of his lengthy review of Neoproterozoic glacial deposits, Schermerhorn commented on the myth-like nature of the concept of global glaciation. Interestingly enough, ancient tales of catastrophic glaciation followed by renewal are a fixture of several northern cultures and reflect a universal creation motif where a divine creator, disgusted with early humanity, decides to wipe the slate clean (Leeming and Leeming, 1994). In the Norse story of Ragnarok the world is brought to a dreadful end by the terrible Fimbulvinter. This story was written in 1220 A.D., as part of the epic poem Edda by the Icelander Snorris Sturluson. Other Norse creation myths tell of the evil Ice Giant Ymir, who is clearly based on folk memories of the last glaciation, 'from whose body the world was made. Ymir turned his body into the earth and his blood into the seas. His bones became mountains and his teeth became rocks'. Any geologist who has spent time working on modern glaciers will instantly recognise the imagery of a glacier slowly melting and retreating. Here in Canada, First Nation legends talk of the turtle (the land) being weighed down by a giant white toad that gobbled up all the fresh water; clearly a reference to the last ice sheet along whose margins Paleo Indians followed into what is now central Canada some 12,000 years ago. As the toad died, so the turtle was able to stand erect and the waters disappeared; we call this today 'glacioisostatic rebound'. 24 The forensic climatologist H. Lamb (1978) recounts folk legends from Asia and Iran where a golden age is destroyed by intense cold. Recently, writers of science fiction have taken up the theme. Louis Agassiz was clearly tapping into a universal fear when he proposed his devastating Eiszeit in 1837. More recently, the science fiction writer Aldiss (1985) writes in his Helliconia trilogy of the catastrophic nature of a global glaciation when 'cold gripped the favoured lands of the equator' and the planet 'lay in a chill catalepsy' 'wiping the Earth clear of festering civilizations'. Many will clearly remember the effects that a few years of bad North American winters in the late 1970s with 'killer blizzards', combined with a slight dip in global temperatures, had on the media and the popular press (e.g., 'the Ice Age comes'; Halacy, 1978). The theme of killer blizzards reemerges in the recent Hollywood blockbuster The Day After Tomorrow. 25 In summary, the notion of globally widespread glaciation is one of the most enduring ideas in geology and has surviving from Agassiz's Eiszeit and the catastrophist school of Cuvier to re-emerge in a different iteration as Snowball Earth in the late 1990s. Many of the assumptions behind the current model were first made in the 1920s by those who dismissed continental drift, and these notions have survived the plate tectonics revolution completely unscathed. The wide geographic distribution of rocks that are liberally interpreted as 'tillites' is still one of the planks of the Snowball Earth model despite advances in understanding of plate tectonics, crustal history and sedimentology. It may well be that late Neoproterozoic glaciation was regional in scope and tectonically preconditioned as a result of the breakup of Rodinia. Much fieldwork remains to be done on Earth's ancient glacial climates using well-tried uniformitarian principles embodied in sedimentary basin analysis. The research on which this article is based was funded by the Natural Science and Engineering Research Council of Canada. I thank many individuals, principally Nicole Januszczak, Carolyn Eyles, Andrew Miall and John Crowell for many very helpful discussions. Alan Morgan and Grant Young reviewed the manuscript and I am grateful for their comments. The views cited herein are entirely those of the author. Agassiz, E.C., 1886, Louis Agassiz, his life and correspondence: Boston, Houghton, Mifflin and Co., v. 11, p. 639. Agassiz, L., 1876, Geological Sketches: 2nd series, Boston, J.R. Osgood and Co., p. 153-229. Agassiz, L. and Coutinho, J.M. da Silva, 1868, Sur la geologie de L'Amazone: C.R. Acad. Sciences, Paris, v. 64, p. 1269-1271. Aldiss, B., 1985, Helliconia Winter: Jonathan Cape, London. 392 p.
Anderson, J.B., 1983, Ancient glacial-marine deposits: their spatial and temporal distribution, in Glacial-Marine Sedimentation: B.F. Molnia, Plenum Press, New York, p. 3-92. Baum, S.K. and Crowley, T.J., 2001, GCM Response to Late Precambrian (~590 Ma) Ice-Covered Continents: Geophysical Research Letters, v. 28, p. 583-586. Bekker, A., Eriksson, K.A., Kaufman, A.J., Karhu, J.A., and Beukes, N.J., 1999, Paleoproterozoic record of biogeochemical events and ice ages: Geological Society of America Abstracts with Programs, v. 31, p. 487. Bolles, E.B., 1999, The Ice Finders: Counterpoint, Washington, D.C., 257 p.
Branner, J.C., 1893, The supposed glaciation of Brazil: Journal of Geology, v. 1, p. 753-772. Budyko, M.I., 1982, The Earth's Climate: Past and Future: Academic Press, 307 p.
Carozzi, A.V., 1966, Agassiz's amazing geological speculation; The Ice Age: Studies in Romanticism, v. 2, p. 57-83. Carozzi, A.V., 1967, Studies on Glaciers. Translated and edited by A.V. Carozzi, Hafner Publishing New York, 213 p.
Carozzi, A.V., 1974, Agassiz's influence on geological thinking in the Americas: Archives des Sciences: Societe de physique et d'histoire naturelle de Geneve, v. 27, p. 5-38. Chumakov, N.M., 1981, Upper Proterozoic glaciogenic rocks and their stratigraphic significance: Precambrian Research, v. 15, p. 373-395. Coleman, A.P., 1907, A lower Huronian ice age: American Journal of Science, v. 23, p. 187-203. Coleman, A.P., 1908, Glacial periods and their bearing on geological theories: Geological Society of America, Bulletin, v. 19, p. 347-366. Coleman, A.P., 1916, Dry land in geology: Geological Society of America, Bulletin, v. 27, p. 175-192. Coleman, A.P., 1926, Ice Ages. Recent and Ancient: The MacMillan Company, 296 p.
Coleman, A.P., 1932, Glaciation and continental drift. Geographical Journal, v. LXXIX, p. 252-255. Coleman, A.P., 1939, Ice ages in the geological column: Geological Society of America, Bulletin, v. 50, p. 449-452. Coleman, A.P., 1941, The Last Million Years: AMS Press, New York, 216 p.
Cotton, C.A., 1942, Climatic Accidents in the Landscape: Whitcombe & Tombs, New Zealand, 354 p.
Crowell, J.C., 1957, Origin of pebbly mudstone: Geological Society of America, Bulletin, v. 68, p. 993-101. Crowell, J.C., 1999, Pre-Mesozoic Ice Ages: Their Bearing on Understanding the Climate System. Geological Society of America, Memoir, v. 192, 106 p.
Davis, G.M., 1908, Causes of Permo-Carboniferous glaciation: Journal of Geology, v. 16, p. 79-82. Dott, R.H., 1961, Squantum "Tillite", Massachusetts; evidence of glaciation or subaqueous mass movements? : Geological Society of America, Bulletin, v. 72, p. 1289-1306. DuToit, A.L., 1921, Land connections between the other continents and South Africa in the past: South African Journal of Science, v. 18,p. 120-40. Evans, D.A.D., 1999, A Proterozoic palaeoclimatic paradox persists: Tectonics Special Research Center, Annual Report, p. 63-64. Eyles, N., 1993, Earth's glacial record and its tectonic setting: Earth Science Reviews, v. 35, p. 1-248. Eyles, N. and Januszczak, 2004a, Interpreting the Neoproterozoic glacial record: The importance of tectonics, in G.S. Jenkins, M.A. McMenamin, C. McKay and L. Sohl, eds., The Extreme Proterozoic: Geology, Geochemistry and climate: American Geophysical Union, Geophysical Monography 146, p. 125-144. Eyles, N. and Januszczak, 2004b, Zipper rift: A tectonic model for Neoproterozoic glaciations during the breakup of Rodinia after 750 Ma. : Earth Science Reviews, v. 65,p. 1-73. Flint, R.F., 1957, Glacial Geology and the Pleistocene Epoch: John Wiley, New York, 589 p.
Geikie, J., 1894, The Great Ice Age: Third Edition, Spottiswoode and Co., London. 850 p.
Gevers, T.W., 1931, An ancient tillite in South West Africa: Transactions of the Geological Society of South Africa, v. 34, p. 1-17. Grabau, A.W., 1920, A Textbook of Geology: D.C. Heath and Co., Boston, 976 p.
Grey, K., Walter, M.R., and Calver, C.R., 2003, Neoproterozoic biotic diversification: Snowball Earth or aftermath of the Acraman impact? : Geology, v. 31, p. 459-462. Halacy, D.C., 1978, Ice or Fire? Surviving Climatic Change: Harper and Row, 212 p.
Hallam, A., 1989, Great Geological Controversies: Oxford Science Publications, 244 p.
Hambrey, M.J. and Harland, W.B., (eds. ), 1981. Earth's Pre-Pleistocene Glacial Record: Cambridge University Press. Harland, W.B., 1964, Critical evidence for a great infra-Cambrian glaciation: Geol. Rundsch., v. 54, p. 45-61. Harland, W.B. and Bidgood, D.E.T., 1959, Palaeomagnetism in some Norwegian Sparagmites and the Late pre-Cambrian Ice Age: Nature, v. 184, p. 1860-1862. Harland, W.B. and Herod, K.N., 1975, Glaciations through time, in Wright, A.E. and Moseley, F. (eds. ), Ice Ages: Ancient and Modern, Seel House Press, Liverpool, p. 189-216. Hoffman, P.F. and Schrag, D.P., 2000, Snowball Earth: Scientific American, January, p. 69-75. Hoffman, P.F. and Schrag, D.P., 2002, The snowball Earth hypothesis: testing the limits of global change: Terra Nova, v. 14, p. 129-155. Hoffman, P.F., Kaufman, A.J., Halverson, G.P., and Schrag, D.P., 1998, A Neoproterozoic Snowball Earth: Science, v. 281, p. 1342 -1346. Hyde, W.T., Crowley, T.J., Baum, S.K., and Peltier, W.R., 2000, Neoproterozoic 'snowball Earth' simulations with a coupled climate/ice-sheet model: Nature, v. 405, p. 425-429. Kennedy, M.J., Christie-Blick, N., and Prave, A.R., 2001a, Carbon isotopic composition of Neoproterozoic glacial carbonates as a test of paleoceanographic models for snowball Earth phenomena: Geology, v. 29,p. 1135-1138. Kennedy, M.J., Christie-Blick, N., and Sohl, L.E., 2001b, Are Proterozoic cap carbonates and isotopic excursions a record of gas hydrate destabilization following Earth's coldest intervals? : Geology, v. 29, p. 443-446. Kennedy, M.J., Runnegar, B., Prave, A.R., Hoffman, K.-H. and Arthur, M.A., 1998, Two or four Neoproterozoic glaciations? : Geology, v. 26, p. 1059-1063. Kirschvink, J.L., Giados, E.J., Betrani, E., Beukes, N., Gutzmer, J., Maepa, L.N., and Steinberger, R.E., 2000, Paleoproterozoic Snowball Earth; extreme climatic and geochemical global change and its biological consequences: Proceedings National Academy of Sciences 97, p. 1400-1405. Kuenen, P.H. and Migliorini, C.I., 1950, Turbidity currents as a cause of graded bedding: Journal of Geology, v. 58, p. 91-127. Lamb, H., 1978, Climatic history and the Future: Princeton University Press, 835 p.
LeGrand, H.E., 1988, Drifting Continents and Shifting Theories: Cambridge University Press, New York, 313 p.
Leeming, D. and Leeming, M., 1994, A Dictionary of Creation Myths: Oxford University Press, 330 p.
Li, Z.X. and Powell, C.M., 2001, An outline of the palaeogeographic evolution of the Australasian region since the beginning of the Neoproterozoic: Earth Science Reviews,v. 53, p. 237-277. Martin, H., Porada, H. and Walliser, O.H., 1985, Mixtite deposits of the Damara sequence, Namibia: Problem of interpretation. Palaeogeography, Palaeoclimatology, Palaeoecology, v. 51, p. 159-196. Mawson, D., 1949, The late Precambrian iceage and glacial record of the Bibliando Dome: Journal and Proceedings of the Royal Society of New South Wales, v. 82, p. 150-174. Mawson, D., 1958, Letter to Sir Raymond Priestley, in F. Jacka, and E. Jacka (eds. ), Mawson's Antarctic Diaries: 1988, Unwin, 414 p.
McKenzie, D.P. and Parker, R.L., 1967, The north Pacific: An example of tectonics on a sphere: Nature, v. 216, p. 1276-1280. Meert, J.G. and Torscik, T.H., 2004, Paleomagnetic constraints on Neoproterozoic 'Snowball Earth' continental reconstructions, in G.S. Jenkins, M.A. McMenamin, C. McKay and L. Sohl, eds., The Extreme Proterozoic: Geology, Geochemistry and climate: American Geophysical Union, Geophysical Monography 146, p. 5-12. Narbonne, G.M., 1998, The Ediacara biota: a terminal Neoproterozoic experiment in the evolution of life: GSA Today, v. 8, p. 1-6. North, F.J., 1943, Centenary of the Glacial Theory: Proceedings of the Geologists' Association, LIV, p. 1-28. O'Brien, C.F., 1971, Sir William Dawson. A Life in Science and Religion: American Philosophical Society, Philadelphia, 207 p.
Pauly, K.A., 1957, The Cause of the Great Ice Ages: Privately printed, 60 p.
Peltier, W.R., Tarasov, L., Vetoretti, G., and Solheim, L.P., 2004, Climate dynamics in deep time: Modeling the "Snowball Bifurcation" and assessing the plausibility of its occurrence, in G.S. Jenkins, M.A. McMenamin, C. McKay and L. Sohl, eds., The Extreme Proterozoic: Geology, Geochemistry and climate: American Geophysical Union, Geophysical Monography 146, , p. 107-124. Pettijohn, 1984, Diary of an Unrepentant Field Geologist: University of Chicago Press, Chicago, 260 p.
Reusch, H., 1891, Skruinsmerker og moraenegrus eftervist i finmarken fra en period megetaeldre end "istiden": Nor. Geol. Unders., v. 1, p. 97-100. Sayles, R.W., 1914, The Squantum Tillite: Memoirs of the Museum of Comparative Zoology at Harvard College. v. X.
Sayles, R.W., 1919, Seasonal deposition in aqueoglacial sediments: Memoirs of the Museum of Comparative Zoology at Harvard College. v. XLVII. Schermerhorn, L.J.G., 1966, Terminology of mixed coarse-fine sediments: Journal of Sedimentary Petrology, v. 36, p. 831-836. Schermerhorn, L.J.G., 1974, Late Precambrian mixtites: Glacial and/or nonglacial? : American Journal of Science, v. 274, p. 673-824. Schermerhorn, L.J.G., 1975, Tectonic framework of Late Precambrian supposed glacials: in A.E. Wright and F. Moseley, eds., Ice Ages: Ancient and Modern: Geological Journal Special Publication, p. 241-274. Shields, G.A., Brasier, M.D., Stille, P., and Dorjnamjaa, D., 2002, Factors contributing to high 13C values in Cryogenian limestones of western Mongolia: Earth and Planetary Science Letters, v. 196, p. 99-111. Sohl, L.E., Christie-Blick, N., and Kent, D.V., 1999, Paleomagnetic polarity reversals in the Marinoan (ca. 600 Ma) glacial deposits of Australia: Implications for the duration of low-latitude glaciation in Neoproterozoic time: Geological Society of America, Bulletin, v. 111, p. 1120-1139. Thompson, M.D. and Bowring, S.A., 2000, Age of the Squantum "tillite", Boston Basin, Massachusetts: U-Pb zircon constraints on terminal Neoproterozoic glaciation: American Journal of Science, v. 300, p. 630-655. Tojo, B. et al., 1999, Cyclicities in Earth-warming episode recorded in the Rasthof cap carbonate overlying the Neoproterozoic Chuos diamictite in Namibia: Geological Society of America Abstracts with Programs,v. 31, p. 486-487. ..
Wegener, A.L., 1912, Die entstehung der kontinente: Geologische Rundschau, v. 3,p. 276-292. Wegener, A.L., 1924, The Origin of Continents and Oceans: Translation J.G.A. Skerl of 3rd German ed., Methuen & Co. Ltd., London. Wegener, A.L., 1928, Two notes concerning my theory of continental drift, in van der Gracht, W.A.J.M. van Waterschoot, ed., Theory of Continental Drift: A Symposium: American Association of Petroleum Geologists, Tulsa, p. 97-103. Willis, B., 1944, Continental Drift: Ein märchen: American Journal of Science, v. 242, p. 509-513. Winterer, E.L., 1963, Late Precambrian pebbly mudstone in Normandy, France, in A.E.M. Nairn, ed., Problems in Paleoclimatology, Interscience, London, p. 159-178. Young, G.M., 1992, Late Proterozoic stratigraphy and the Canada-Australia connection: Geology, v. 20, p. 215-218. Young, G.M., 2003, Stratigraphic and tectonic settings of Proterozoic glaciogenic rocks and banded iron-formations: relevance to the Snowball Earth debate: Journal of African Earth Sciences, v. 35, p. 451-466. Young, G.M. and Gostin, V.A., 1989, An exceptionally thick upper Proterozoic (Sturtian) glacial succession in the Mount Painter area, South Australia: Geological Society of America, Bulletin, v. 101, p. 834-845. Young, G.M. and Gostin, V.A., 1991, Late Proterozoic (Sturtian) succession of the North Flinders Basin, South Australia: an example of temperate glaciation in an active rift setting, in J.B. Anderson and G.M. Ashley, eds., Glacial Marine Sedimentation: Paleoclimatic Significance, Geological Society of America Special Paper, p. 207-223.